Alka Fit water is negatively charged alkaline water which creates energy by giving up ions to positive ions. 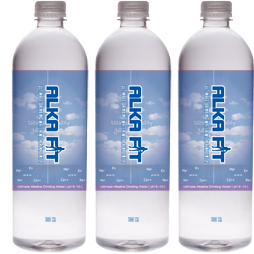 Alka fit water is an "antioxidant." Antioxidants reduce cellular and DNA damage caused by free radicals. By drinking Alka Fit water you can feel the difference usually within a few days. Faster hydration allows the body to regulate its temperature more efficiently and is produced by smaller water molecule clusters passing through cell walls. The absorption rate of alkaline water is 6 to 8 times faster than regular water. Ionization breaks clusters of water molecules into smaller micro-clusters, reducing the size of the clusters from the 11-16 molecules in standard water to just 5-6 molecules in ionized water. Scientists have known for years that most bacteria and viruses can only flourish and grow rapidly in a very acidic environment. It is important for our bodies to be in a state of slight alkalinity. Alkaline water acts as an antioxidant due to smaller size, micro-clusters of ionized water molecules which are expelled from the cells more efficiently, flushing damaging toxins out of the cells and out of the system. It is an efficient way to increase oxygen levels and eliminate acidic waste products in one's body and gently cleanses at a deep cellular level. Acid wastes from food and environmental pollutions are dumped into the bloodstream and lymph, and transported to the liver and kidneys for the detoxification processing and elimination. 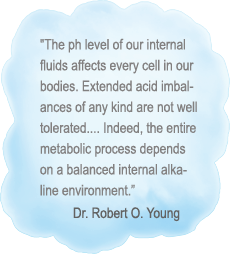 The pH level of our internal fluids affect every living cell in our bodies. A chronically over acidic pH level can create an extremely negative environment which affects all cellular functions from the beatings of the heart to the neural workings of the brain. Drinking alkaline water releases fats and creates weight loss. Too much acidity (toxins) in the body tends to stock up lipids over a period of time. Continual drinking of alkaline water can reduce the body's acidity and stop fat storage build up. Micro-clusters of ionized water help flush acid and toxins from the system. Once fat cells are no longer needed, the body will eliminate them and the fat melts away. Increasing your consumption of good quality tap water or filtered water can transform your health and play a central role in the healing of virtually all degenerative diseases, however, alkaline water has profound long-term effects because it alkalizes your body and provides an effective antioxidant. By drinking Alka Fit water, the aging process could possibly be reversed and the wastes can be reduced in the long-term to a level of a much younger person. Thus, the functions of the organs can be revived. The testimonials are beyond fantastic. This water provides better oxygenation directly to the blood stream and allows optimum cleansing and detoxification. The negative charge of ionized alkaline water will attract the positive ions of acids and neutralize them within the body. Alcohol is very acidic so anything that will help your body balance to be more alkaline is definitely helpful.